On October 4, the day before the last presidential debate in Brazil, Jair Bolsonaro, the ultra-right wing candidate, took to social media and announced that the TV station, TV Record, owned by right-wing evangelical preacher Edir Macedo, would broadcast an exclusive interview with him in the same time slot as the debate. Bolsonaro had already announced that he would not participate in the debate as he was reportedly still recovering from the stabbing which occurred in early September. However, the interview was a clear attempt to steer attention away from the event which saw the participation of seven of the thirteen presidential candidates. One of the central themes of the debate was Bolsonaro himself. Most of the candidates, irrespective of their diverse ideological positions, criticized the hard-line conservative and fascist postures and policies of the ex-armyman and presidential candidate. The upcoming elections in Brazil are of utmost importance to the country. It will be the first presidential elections since the parliamentary coup d’etat that forced democratically elected Dilma Rousseff out of office. Following Rousseff’s deposition, Michel Temer took control of the executive branch and proceeded to roll back workers’ rights, social rights, sell off Brazil’s natural resources and national companies. The tactics of the constitutional coup were again deployed when it came to the legal process against former president Luiz Inácio Lula da Silva. The prosecution moved at an alarmingly fast rate, leading to his incarceration in April 2018 despite many legal irregularities. However, Lula continued his campaign for being elected as president and was the frontrunner in all opinion polls. But in September, the supreme electoral tribunal of Brazil rejected his candidacy despite formal requests from the UN Human Rights Council to respect and guarantee the full exercise of his political rights. When his candidacy was made impossible, Lula handed over the banner of struggle to former education minister and mayor of São Paulo Fernando Haddad, who is running on the Workers’ Party ticket, alongside Manuela D’Avila of the Communist Party of Brazil. Haddad and D’Avila have vowed to continue defending Lula’s program to defend Brazil’s democracy and sovereignty, invest in Brazil’s people, guarantee workers’ rights, pensions, and rights of minorities and marginalized communities. The National Board of the Landless Rural Workers’ Movement (MST) released a statement on October 5 in which they criticized the continuation of the coup and the erosion of Brazilian democracy. They extended their full support to Haddad and pointed out how the emergence of Bolsonaro was facilitated by the coup process itself. The mobilization on the streets in support of democracy during the presidential campaign has been constant. Lula’s legal process and eventual incarceration was accompanied by massive marches and actions, and since his imprisonment in the Federal Police headquarters in Curitiba, Brazil, organizations like the MST have helped sustain a permanent vigil outside to show their support. 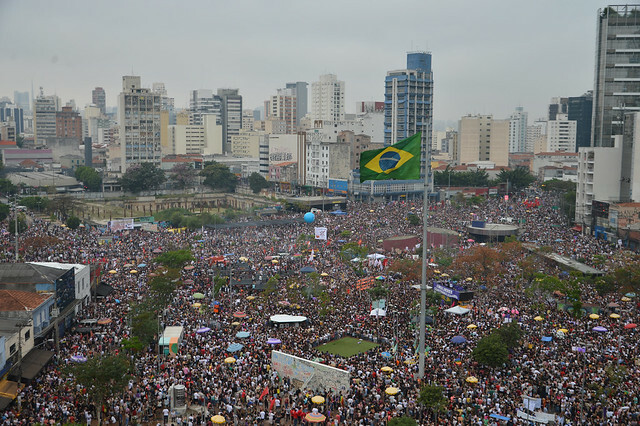 In August, tens of thousands from the MST participated in a national march to Brasilia to register the candidacy of Lula. In recent weeks, with the troubling popularity of Bolsonaro and rise in violent attacks by right-wing hate groups, Brazilian women launched a campaign on social media #EleNão (#NotHim). Last Saturday, around one million women took to the streets across Brazil and protested the return to fascism that Bolsonaro represents with his hate speech against minorities and marginalized communities and outright support for the military dictatorship. Tomorrow, thousands of women will take to the streets again to make a last show of repudiation of the extreme right-wing candidate before the elections.